I look forward to meeting all of your production and events needs! After ten years as Santa Barbara County Film Commissioner, during which time he worked on thousands of productions throughout the area, Geoff Alexander had the opportunity to take over ownership of the longest operating locations company in the Tri-County area, Santa Barbara Location Services. With years of insider knowledge of scouting, locations, permitting, neighbor and governmental relations, local production services, and with highly advantageous relationships with local hoteliers, Santa Barbara Location Services should be your first call when shooting in the area. Our library of thousands of locations include some of the most epic estates in the world, ranches, wineries, farmhouses, cottages and small towns, ultra-modern homes and more are all available to fulfill your creative mandate! I can’t tell you how pleased KT and I are with the shoot. You did a truly awesome job. You are super easy to work with, you do exactly what you say you will do - plus, you were extremely respectful of our house and possessions, and you were incredibly patient with our foibles. We also very much enjoyed working with the crew. They also were very respectful of the house and our belongings, they were friendly, and they doggy-sat Linus (and gave him a workout he won’t forget soon!). It was really fun for us to see “behind the curtain” just a bit. Meeting ****. ***, ****** and **** was a treat. And, of course, we can’t forget the cuisine! Finally, the cleanup crew was fantastic - the whole clean up and put it back together process was fantastic. The place is cleaner and better put together than it was before the shoot! Truly! It was a pleasure to work with you while we were shooting 20th Century Women in Santa Barbara. Your in-depth knowledge of locations and producing in Santa Barbara made you an important addition to our process. You handled everything with grace and aplomb. Your knowledge and experience makes you very valuable. We hit a lot (HUGE understatement!) of hurdles along the way but every time we knew we could turn to you to help us prepare for battle and get things done. There is no way we would have been able to do it without you on our side. We can scout and provide current photographs directly from the field within twenty four hours, and often same day!. We will secure and negotiate contracts with locations and are able to provide trained site managers as needed. 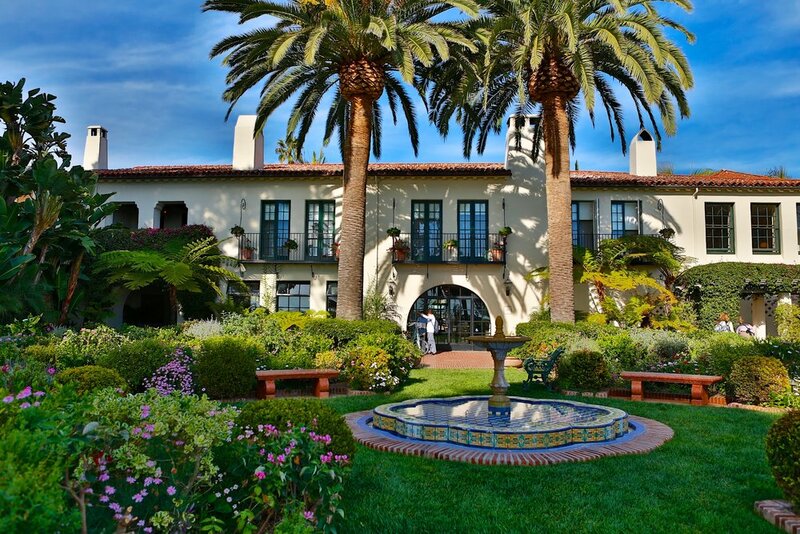 Through our partnership with the area's premier travel agency, Santa Barbara Travel Bureau, we will leverage our volume of bookings to obtain the most competitive rates possible for your production's lodgings needs. We also are able to handle transportation and black car service as needed. With years of experience working with all of the permitting jurisdictions in Santa Barbara County we will painlessly and quickly manage your permitting process. Our close relationships with the people responsible for issuing your permit are invaluable when running in to obstacles or last minute changes. We have the connections to facilitate your critical production needs including securing high quality location catering, P.A.s and other local hires, equipment rentals, parking and base camps and more! We have over 50 marquee level properties in Montecito, Santa Barbara, the Santa Ynez Valley, and Ojai and as far south as Northern Malibu and as far north as San Louis Obispo available for corporate events, weddings, and private occasions. Because of privacy issues, we do not post our available venues on this site but during your free consultation, you will be shown extensive images of almost every area of the properties that meet your specific request. Prices range from approximately $2,000 to $75,000 depending on the amount of people, hours of use and grandeur of the property selected. We have been fortunate over the years to have located sites for many celebrities both in the sport and entertainment field. In most cases we sign a confidentiality agreement that prevents us from discussing events regardless of the fact that many have made headlines. Dream Locations is the wedding and event location service division of Santa Barbara Location Services. For over 20 years, Dream Locations has been the place to call when needing a special site for your event. We represent only private properties -- no hotels, schools, institutions or parks. Properties go from North Malibu to San Luis Obispo County (including Ojai and Santa Ynez). We'll meet with you for a free consultation to determine the date, the occasion, the amount of people, the ambiance you wish to create and whatever else will help us locate the preferred venue for you.